Amidst work and exams, one has to find a little play time to relieve those stressful thoughts that lurk at the corner of our minds. 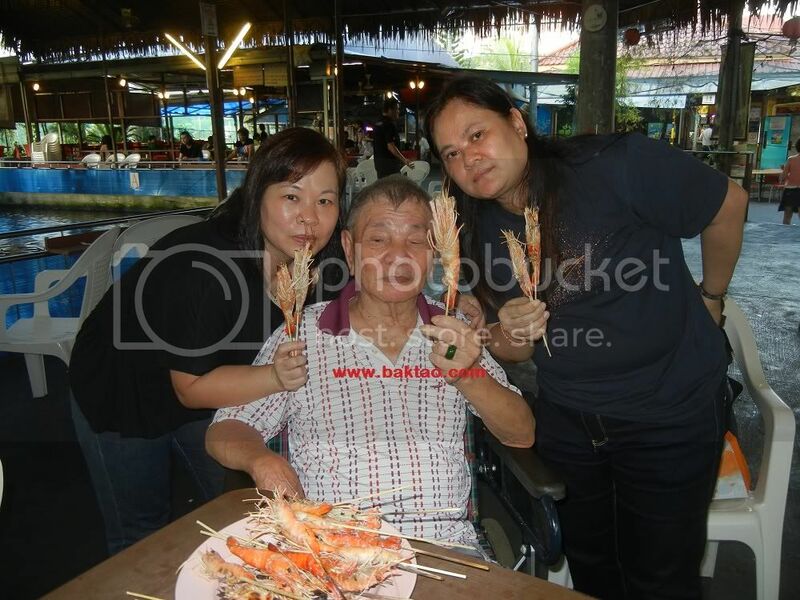 My mum had some ideas about bringing my grandfather on prawning trip on a Thursday afternoon to Bottle Tree Park at Khatib but I protested vehemently since I had a bad prawning trip at Bottle Tree Park once. The pond water level was shallow there and the prawning hook up rates weren't amazing. My mum was a complete newbie at prawning so in the end I suggested Bishan Haibin since I had decent prawning experiences there. Haibin at Bishan was also one of the more established prawning ponds in Singapore and had decent surroundings with a beer garden and fish spa. 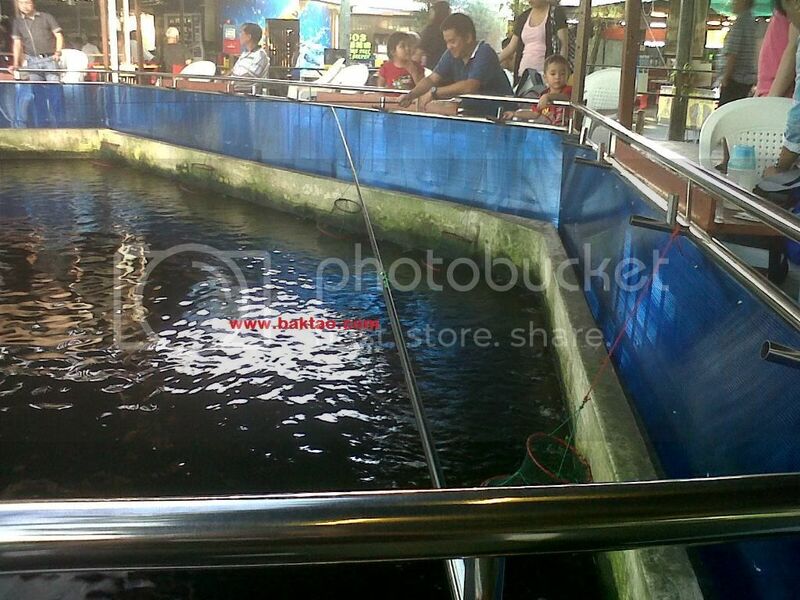 I made some time to accompany my mum and grandfather so that they can have some guidance and prawning tips. 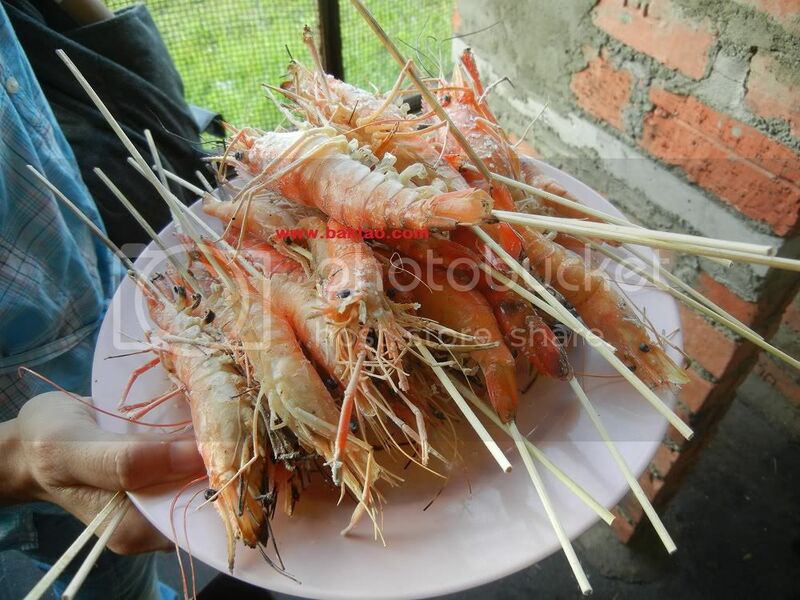 When we got to the place, I realised that the prawning rates had went up to $33 per 3 hours and also, there weren't any longer prawning rods to be had. Well, if you are a regular at Bishan prawning, I'm sure that you will know many prawns actually play around the middle of the pond near the ventilation area. We chose the top section of the prawning area - ponds A and B. Grandfather did suprisingly well and managed to haul up some prawns without even striking them! I noticed this strange behaviour of the prawns today (or nowadays?). The small prawns don't seem to "run with the bait" already and they are much easier to hook up too! Also, there were lots of small fishes nibbling at the chicken heart bait. 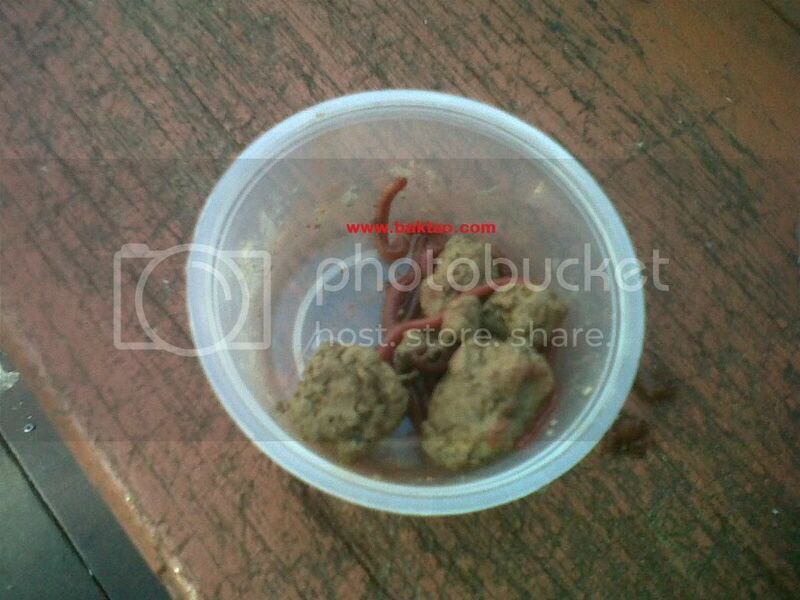 We also purchased some earthworms to use as baits. There were no yabbies caught this time but we had lots of fun when the prawns were biting but as the bite slowed down, it got boring I guess but not before I guided mum to catching some prawns of her own! 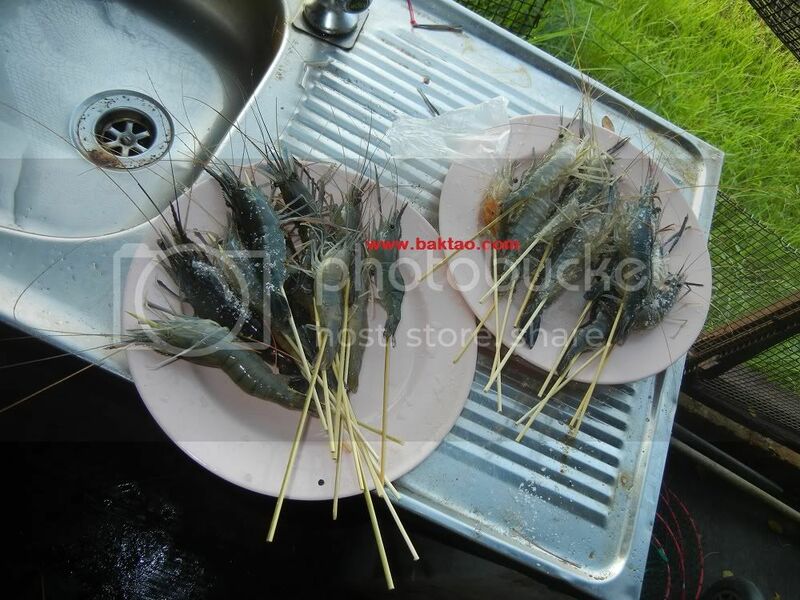 In all, we managed around 30plus pcs of prawns between 2 rods for 3 hours. It wasn't a great catch but neither was it a bad catch considering grandfather was playing a fool most of the time! Ah gong with the prawns! Sometimes people question the economic sense in prawning but this I feel should always come second. 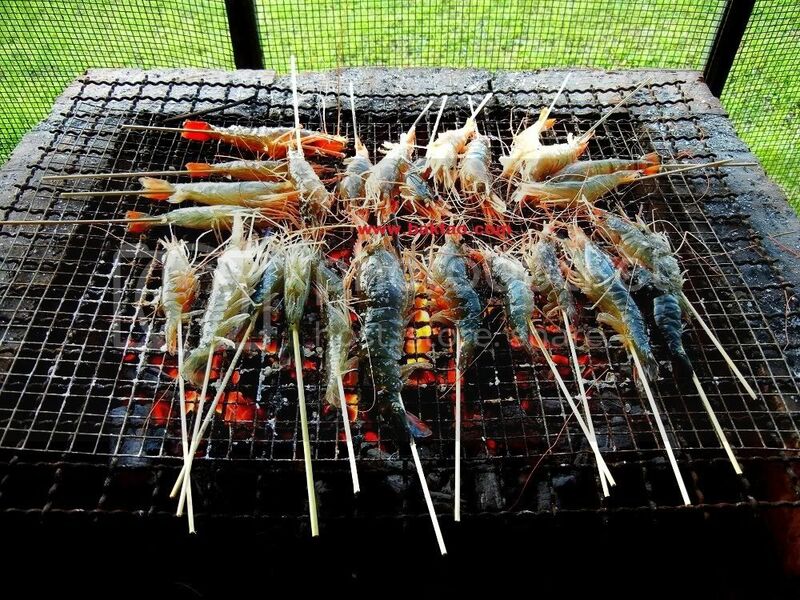 It is the quality time and laughter that makes prawning a truly remarkable experience. For the guys who are after girls, it is also a chance to show your mascular side and rescue your girlfriend from the giant prawn. Hahahaha... Pretty much the same concept as the $5 Patin pole fishing although I do not encourage that form of fishing! Here's the address if you're interested... Bishan Haibin Prawning is open 24 hours a day and parking is free. Many anglers have Emailed me to share my Desaru fishing contacts so I thought why not blog about the contact so everyone can benefit. Desaru is becoming a good convenient place for Singaporeans to cast a jig and satisfy their jigging needs because with the recent ulu tiram highway, Desaru is just 45mins away after crossing the woodlands customs! This means light jigging right at our doorstep! Therefore a one day trip is possible for the angler and it isn't really hard to get a slot compared to local changi offshores or southern islands. The rates of desaru charters are around 650rm to 1000rm depending on the boat size and they launch directly from the Desaru beach. They offer jigging at the famous TU Lighthouse (you can pop too), the famous tukun reef and so on. There is a good range of fishes at Desaru with the most common being pelagic fish - the Queenfish, spanish macks, trevally species and you also have the reef species like groupers and snappers. Now while a one day trip should suffice, a two day trip will also work out. We stayed at the pelangi balau beach resort during our last desaru fishing trip and it was not too bad. For dinner near desaru, one can check out the laksa manan restaurant! Anyway, here's the contacts I have gathered. Ah Hee and Badol/Badok with their numbers. You can also try Ah Long +01860197730833. Call them to find out about the latest charter prices, meeting location and so on! 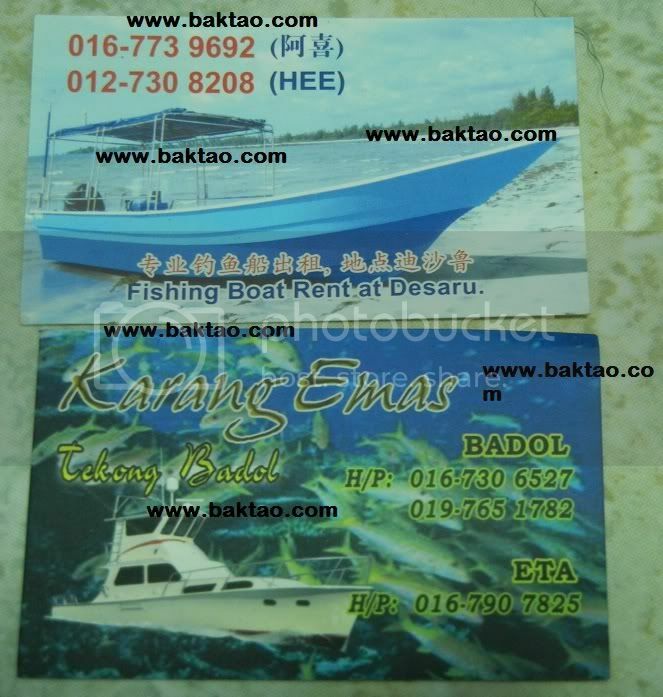 Hi all fishing friend's in Singapore, LE Angler's is organising an eging competition or squid fishing contest in July. 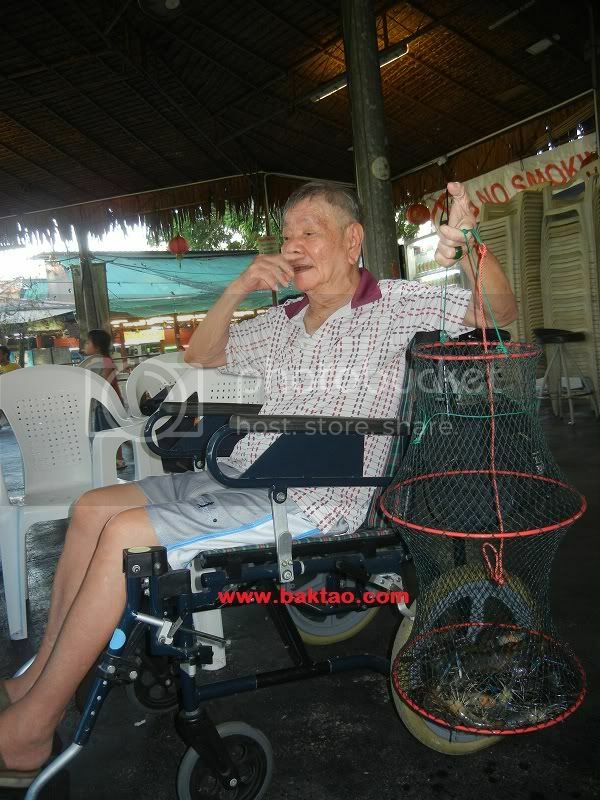 Visit http://acfishing.blogspot.sg/2012/06/le-anglers-house-eging-competition-2012.html for more information! Fishing at Bintan with the Kansas 99! Finally the long awaited Bintan, Tanjung Pinang or TP Fishing had come. So far, half of my TP Trips (some with Elly Kelong (Trikora) or some with Ah Khiang) had been good and the other half had been bad. Some of the fishing pals were just ready for some fishing action after a long break due to work, children and so on. Some wanted revenge from last year. Some had not even went on a 3D2N offshore before. As I had booked this trip very pretty in advance, we had the luxury of a weekend date with Monday being the only weekday. There were some new birds (Shawn, Nick, Mark) but we had some old birds as well so I wasn’t too worried about whether the crew could cope. A pre trip shopping was also put up at beach road before the trip so everyone could buy what they needed. We went to Joe's tackle mainly, Deep Sea Tackle, Angler's Oufitters and even Sabre tackle. It was a good eye opening experience for the guys and also so that I could share my own knowledge on which shop was better for what items i.e loading of line. Thankfully, It was an enjoyable trip at the back of a stressful week for me. And luckily everything went well with logistics and no major problems were encountered. The fishing Icebox issue was no problem with Penguin ferries (now Sindo Ferry) at TMFT long before the trip. I had reserved 8 iceboxes for our group of 8 but we brought 7 anyway. We met up at Tanah Merah Ferry Terminal on a Saturday morning. We were to take the 1020am ferry. Many fishing kakis usually take the earlier ferrys but from experience, I knew it didn’t really matter and that the later ferry would often be less crowded. We checked in our sportubes, bazookas, Iceboxes and went for a quick breakfast at Kilkenny’s. We had ample time to have our breakfast as we looked at the TMFT ferry timing's board and realise our ferry was still a long way away! After a 2 hours brief ferry journey, I met with Ah Jia who was the Kansas 99 operator and he guided us along to our vehicles. 2 MPVs and a lorry for all our equipment. I was appreciative of this as I knew certain operators would cut cost by sending just 2 MPVs and squeezing the rod tubes and iceboxes with the passengers! Two thumbs up to ah Jia for that! 2 MPVs and a lorry. We stopped by the bintan supermarket to grab some supplies like drinks (Coke, 100plus, winter melon tea!) and keropok before heading to the kelong for some seafood lunch. I simply loved the fried prawn fritters here and that is what always made me come back! We had a good hearty lunch with Calamari, Prawn Fritters, chicken in ginger black sauce, vegetable soup, Otah and some veggie. Awesome prawn fitters and lunch at the kelong! The weather was an initial worry at first with the wind hitting us from the moment we set sail. But the rest of the guys simply went to bed! Good tactic I say! Initially I wanted to set up the Calstar 30-50 for some trolling with a Rapala Magnum 12 but the boat was rocking like a cradle! The railings were like touching the water as we rocked! Captain asiq told me we will not be able to fish far out this time as the winds were too strong. We were to hang around Merapas Island and fish. I was disappointed with this news as it means more bulat (bludger trevally) and cobia for sure… but hey that’s fishing! We took cover as we had our awesome dinner of fried sesame chicken wings, sardines and what not. It was here that I tried some eging with my trusty yamashita squid jigs and oh my god a GT attacked one of our squid jigs! Metal jigs and casting minnows I think K Ten blue ocean, jackson pintails and asari pintails were casted out to tempt the GT but it just wouldn’t come… After that it was more travelling to our night fishing spot! I planned this trip to have more table sized fish at night with the slow current in the early part of the night to catch some squid and orientate the new guys coming on board for the first time. Well good news, many squid around! I got quite a few with the squid jig! As long as fresh squid is available, I never saw a slow night's fishing before! It was more of which type of fish that came that usually is the big question. As more sotong arrived, we started to bait with good ol fresh squid… but as I looked around… what?! Where was everyone?? Only me, Weiyee, Pete were out fishing as everyone else were sleeping comfortably in their cabins! So no choice we fished on and fish we did! Action was non stop with Golden Snapper, Cobia, Trevally species and even a surprise shovelnose which got away. As the current pick up after 2am, I expected more ang cho biting but it was silent after that. It was a wasteful night as we lost many fishes during gaffing… In fact, Kiat lost a super big fish suspected to be a giant ray after 2 hours! Come daytime, all hell broke loose as the sleeping kakis woke up to a bulat and jembudok (gold spot trevally) frenzy! They were getting multiple hook ups! Shawn was having fun his new Accurate BX2 500 here! Even captain asiq was jigging and I joined in! There were boiling all around and even dolphins! Some parrot fish were also landed during this time while I snoozed in my cabin…. Ahahahaha… Happy smiles and bending rods. This is what puts a smile on every organizers face! I managed to get a bumpnose trevally aka sagai here! We usually get them on micro jigs but this one took a 100g jig! Second night was the same… squid, cobia, ang cho but only 2 pax fishing this time! But I managed to hit a good sized stingray and brought it up in 8 minutes with a calstar gf600xl 20-50lbs and Poseidon reel. Too bad the fish hit on the calstar and accurate 870 combo! Shawn lost a huge cobia too during this time. It was sad though that fengshan’s rod I think a G Craft Super Short Rodder and Torium 16 couldn’t bring up a suspected giant grouper as the leader broke…. Sigh…. Good fun time too this night but we had to end early as it was a bump ride back to the kelong! Maggi Mee with scooped mantis prawn, crabs, crayfish! After the deckie gutted the fish and packed it all up, we were back on land! 8 FULL ICEBOXES! With approximately 4 iceboxes of fish left on the boat for the captain and the crew because our iceboxes were full! We brought back the trevallies instead of the barracudas. Man, this was a good trip with so many fishes to choose from! We were so tired were we that we didn’t even want to lay out the fish! We made our way to the massage parlour – Pamona massage and shared the fishy stories over some good old traditional indo massage and of course bak ku teh after that! Chilling out at the bakuteh spot! I wanted to bring the guys to a famous restaurant which sold home made sotong balls but it wasn’t open.. that was the only glitch I guess! And it was home sweet home after that 2pm penguin ferry… reached Singapore 5pm with all our fishes! I have already booked 2013's date with the kansas! This time 4D3N to Pengibu! Hope it will be a good bumper harvest again!